DETROIT AIRPORT, MICHIGAN — My long anticipated trip to China has started. 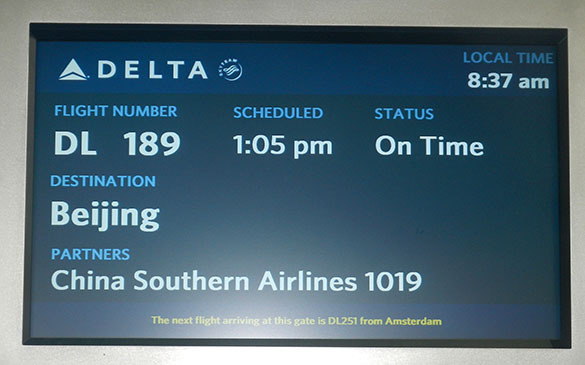 I have a bit of a wait in Detroit before boarding a 14-hour flight to Beijing, followed by a connection on to Shenyang. I am visiting China by invitation from geologists at Northeastern University in Shenyang. My host is Yongli Zhang, an invertebrate paleontologist and geologist. Soon after I arrive we fly to Guizhou Province in the southeast of the country to do fieldwork on Carboniferous carbonates, including fossiliferous reef sequences. My job is to assess the hard substrates and, we hope, find a boatload of encrusters and borings. I’ve never been to China, so this will be an adventure in many ways. Everything will be new to me in the oldest of countries. Right now all four Wooster Geologists are in the field and, effectively, off the grid. Dr. Shelley Judge is in Utah, Dr. Greg Wiles is in Alaska, and Dr. Meagen Pollock is in British Columbia. We will post entries when we can. Don’t worry about Wooster’s Fossil of the Week — it has now moved to Fridays and several posts are already lined up to appear each week!